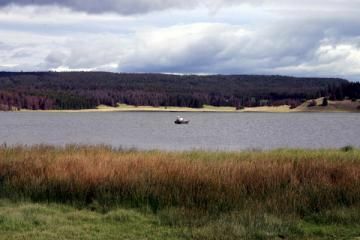 Detailed Description: Tunkwa Lake is one of two very popular high elevation lakes within the Tunkwa Provincial Park which is situated on the Thompson Plateau located north of the community of Logan Lake, British Columbia, Canada. Established April, 1996 the park was created to protect the spawning rivers, grasslands, forests, lakes, wetlands and bogs in the region. The 5100 hectare Tunkwa Provincial Park consists of 3 campgrounds, an extensive trail system and two main lakes - Tunkwa and Leighton Lakes. The park is a summer destination for all who enjoy fishing, hiking, boating, canoeing, atving, motor biking, birdwatching, mountain biking and horseback riding. Tunkwa Lake sits at an elevation of 1135 metres surrounded by grassland fields, wetland marshes, a spawning river, bogs and some forest. The annually stocked lake is a very popular fishing lake for trout. It is listed in the TOP 10 provincial trout fisheries. And it was host to the 1993 World Fly Fishing Championship. Do we need to say more. A roof top boat launch is located in the parking lot of the main day use area on Tunkwa Lake. The many interpretive signs in the day use area explain the surrounding environment and wildlife. There is a small selection of picnic tables and some pit toilets in the day use area. Tunkwa Lake is also a popular location for birdwatching. Interpretive signs in the day use area identify some of the birds to keep an eye out for like Canada Geese, Loons, American Coots, Red Headed Grebes, osprey, eagles and ducks. The campground located on the lake provides campsites for, both, tenters and RVs. Each campsite enjoys a fire pit, picnic table and access to the lake. The limited amenities provided by the lake campground include some pit toilets and a boat launch. Next to Tunkwa Lake a staging for many who enjoy horseback riding, hiking, motor biking, horseback riding and atving (no 4x4 vehicles permitted). In the winter months, after the snow has fallen, the trails in the region transform into cross country ski trails, snowshoe and snowmobiling routes.